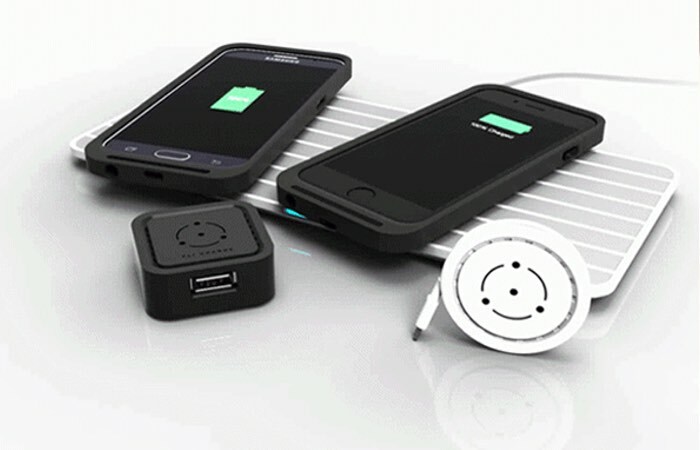 Anyone looking for a wireless charging system for their Android or iOS smartphone might be interested in a new Indiegogo crowdfunding campaign which is launched this month the raised money to take the FLI Charge wireless charging system into production. FLI ChargeHas been specifically designed to provide a simple yet safe charging solution for smart phones tablets and any other mobile devices you may have. Check out the video below to learn more about the system and how you can help bring it to market. FLI Charge is comprised of charging pads called FLIways and FLI Charge-enabled devices. FLIways are plugged into the wall and send power to “swimlanes” on their surface. The FLIway constantly monitors the flow of electricity and immediately halts power transfer if an unapproved object, like liquid, is detected. FLI Charge-enabled devices are embedded with the FLImod, which is a smart chip that is connected to four contact points. The FLIcase makes charging your smartphone a complete afterthought. Available for: Apple iPhone 6, 6s, 6 Plus & 6s Plus | Samsung Galaxy S6, S6 edge, S7 & S7 edge. The FLIcube charges any USB device optimally and as fast as plugging into an outlet. The FLIcoin’s built-in microUSB or Lightning connector makes it easy to charge any device on the go. Power flows from the swimlanes, through the FLImod and then on to your device. The smart chip ensures that the optimal amount of electricity is sent to your device and the geometric relationship between the contact points and swimlanes ensures that the FLImod will remain in contact with at least one positive and one negative swimlane, regardless of the device’s position or orientation on the FLIway, guaranteeing a continuous charge. FLI Charge works with any USB powered device including smartphones, tablets, e-readers, Bluetooth speakers, drones, video game controllers, cameras, GoPros, smartwatches, fitness trackers and more! FLI Charge is best when you have pads in the places you spend the majority of your time. For more information on the new FLI Charge jump over to the Indiegogo website for details and to make a pledge from just $99 by following the link below.